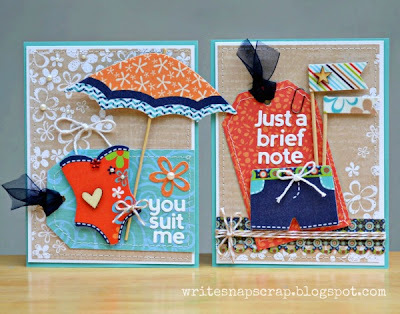 I’m back today with more projects from the August creative kit at My Creative Scrapbook. 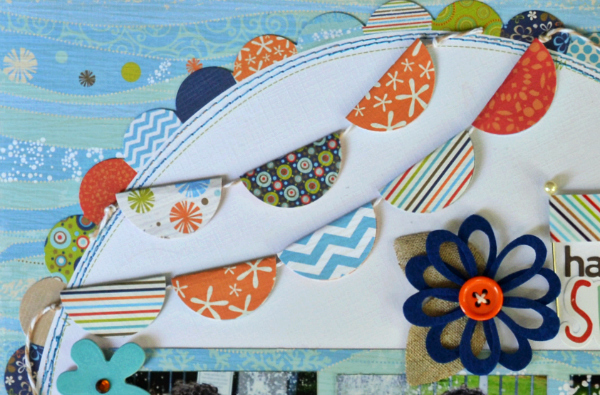 This kit featured the Splash collection from Little Yellow Bicycle and is such a happy paper line, perfect for summer. We live in the South and the local spraygrounds are a favorite hangout for kids of all ages. My little boy is 3 and he just loves to go play in the water. The sprayground is basically a bunch of sprinklers, and, really, what could be more fun when the temperatures hover around 90 degrees? I love the big die cut circle with the colorful scalloped edges and wanted to mimick that look with a half-circle banner. To make the banner, I punched circles, then folded them over a length of twine. At the bottom of the page, I used some of the LYB vellum strips to make little pennants. I backed the vellum with white cardstock then wrapped it around hat pins. I also used the collection to make a pair of summer cards. This Splash line had the cutest “fabric favorites" embellishments. The bathing suits called to me and I knew right away that I would want to make coordinating boy and girl cards. 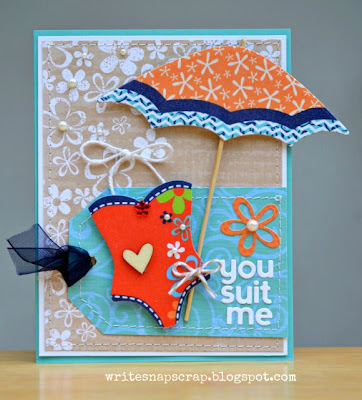 For the boy card, I made a tag from patterned paper then affixed the swimming trunks and a sentiment. I made pennants with the washi tape and hat pins as described in the layout above. For the girl version, I used the same base and made a tag from coordinating patterned paper. To complete the card, I added the swimsuit and umbrella from the fabric fabrics and a sentiment with letter stickers from Jillibean Soup. Love these alphabeans. I love making coordinating cards. It makes fast work of a card set to use similar designs and the same card base. Stunning, stunning..where's the favorite button...LOVE, LOVE it Izzy!!! What a fun page - love how you did the banners and I'll be lifting that idea. And the fun cards. I agree with Lisa - you rocked all things summer. Wow! Beautiful work! Have a wonderful weekend! ALL these projects are sooooooo FUN and sooooooo DARLING! LOVE! Love the banner so sweet and the puns are just cute! Love the circle design on the wave paper! These are all fabulous!!!!! I love love love the colors and loveeeeeeeeeeeee the swimsuit cards!!! ADORABLE!!! I don't know how you manage, but every project you make is out of this world adorable!!! Those coordinating cards are adorable....a really great concept. Believe it or not, I am trying to make cards with my scraps after creating layouts. Love the half circle banners on your layout...the colours and your design capture that joy of running through sprinklers! My kids used to love spray parks too :) Thanks for the inspiration, Izzy! These are absolutely ADORABLE! I love the happy colors and great use of pattern, texture and layers. So cute! Really fun projects, great job! Wow! I love all of these!!! Super cute layout! Your son is so darn cute and you capture the best pictures of him! LOVE your design on the layout! And those cards are too cute! I so like that collection anyway but your examples are oh so cute! LOVING your fun little titles. Really cute flags, thanks for sharing with us at ScrapFIT!